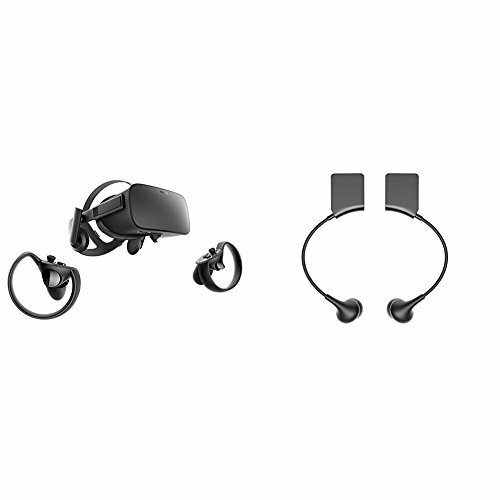 Oculus Rift + Touch Virtual Reality System + Oculus Rift Earphones Bundle by Oculus at Kode Fu Guru. Hurry! Limited time offer. Offer valid only while supplies last. Oculus Rift's advanced display technology combined with its precise, low-latency constellation tracking system enables the sensation of presence. Every aspect of Rift was designed to be easy, inviting, and comfortable to use - and that extends to the VR environment we've created as a starting point for your journeys. 7 Free games included with purchase: Robo Recall, Lucky's Tale, Dragon Front, Quill, Medium, Dead & Buried, and Toybox. Discover and download games across genres ranging from action RPGs, sci-fi shooters, mind-bending puzzle games, and more - and play them from an entirely new perspective. If you have any questions about this product by Oculus, contact us by completing and submitting the form below. If you are looking for a specif part number, please include it with your message.